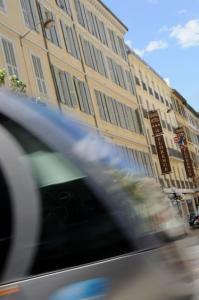 The Grand Hotel Le Florence is ideally located right across from the Nice Etoile shopping center. In a pedestrian area, it is a 5-minute walk from Place Massena and a 10-minute walk from the beach, the Promenade des Anglais and the Old Town. The contemporary-style rooms are air-conditioned and equipped with an LCD TV with Canal+ satellite channels and a mini-fridge. Each has a private bathroom with a bathtub or a shower and organic bathroom amenities. Free Wi-Fi access is available. The Grand Hotel Le Florence serves a buffet breakfast in the breakfast room or in the comfort of guest’s rooms. Guests can also enjoy the on-site bar. There is a tramway stop in front of the hotel, with convenient transport to explore the city. Just over a quarter mile from the Nice Train Station, the hotel is also centrally located for exploring Monaco, 13 miles away or Cannes, 22 miles away. Nice International Airport is only a 15-minute drive from the property.